I'm trying to spruce up our home office space, but since we are having the house painted this summer, I don't want to spend much on the project. Ultimately, I'd like to have a guest bed in there but for now I think pretty corner chair with some decor will do the job. 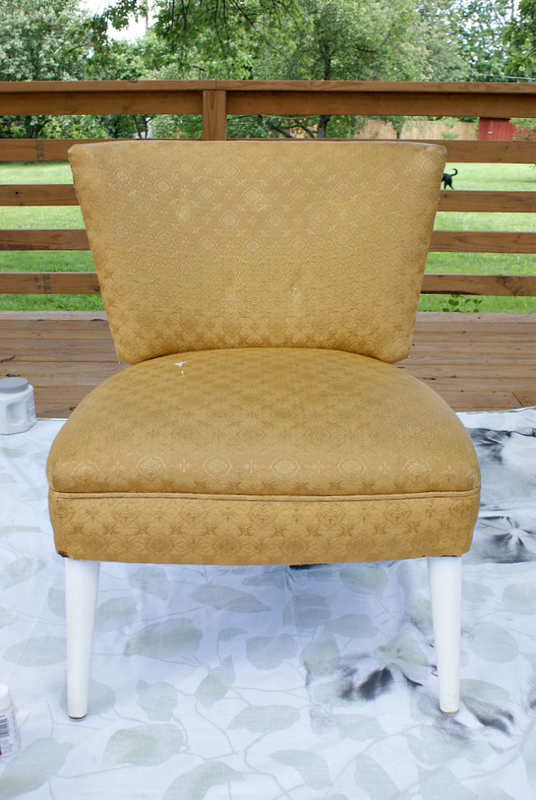 I had this vintage slipper chair (it was previously located in B's room) and I thought it might be fun to try painting the upholstery. 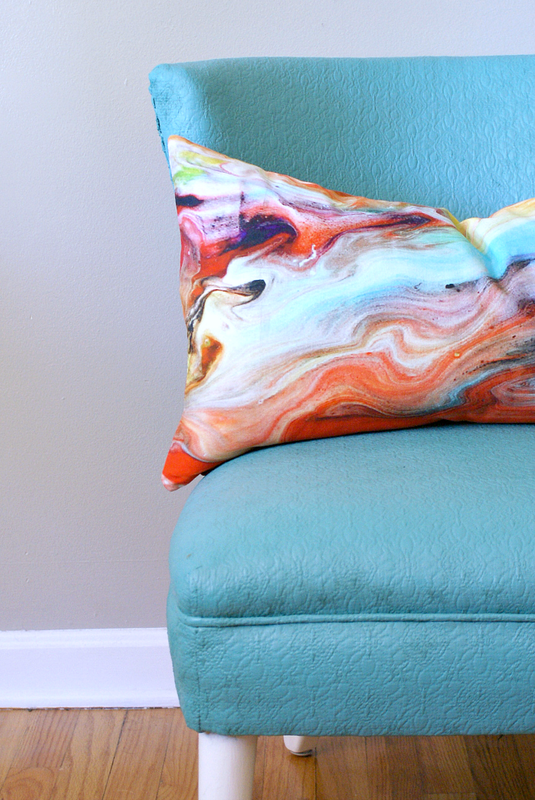 Have you come across upholstery painting or tried it? It's been around for a while, and there are several good tutorials out there. This is the method I used, it's a little of this and a little of that from several other sources. Latex satin paint - I used leftover from paint from our bathroom re-do. Fabric medium - this stuff is usually located in the painting section with acrylic paints and brushes. 200 grit sand paper - I didn't end up using this, but you might need it to gently sand away fuzzies, depending on the type of fabric your piece is covered in. Drop Cloth - I always save old shower curtains and use them as drop cloths. First, I mixed up a batch of fabric paint by combining one part medium, one part paint, and two parts water. So, my first batch was 2 ounces fabric medium, 2 ounces paint and four ounces of water. This wasn't quite enough to do the entire first coat, so I mixed up a second batch exactly like it. This paint solution is very watery and runs a lot, so I used a drop cloth and also taped the legs; I even stopped part way through painting the front to finish wrapping them! Next, I sprayed the fabric with some water, rubbing it in a little. This gets the fabric ready to absorb the paint mixture. Side note - I don't believe this process would work well with new upholstery as most pieces are treated with water repellent / stain repellent chemicals that would keep the paint from absorbing easily into the fabric. 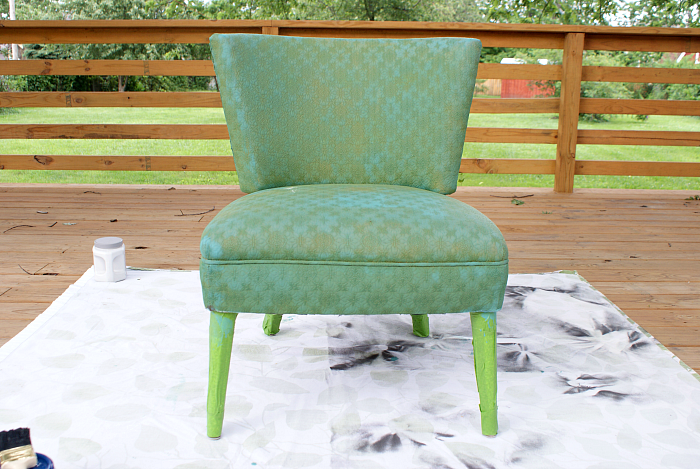 I worked my way around the chair, covering it with the fabric paint mixture. For corners and seams, like the piping around the seat, I used my fingers to work the paint down into the cracks. Once the first coat was finished, I let it dry for twenty four hours. I suspect you could apply the second coat within a few hours, this is just how it worked out for me because it was the soonest I could get back to the project. Here's how the chair looked after one coat of the paint, medium and water mixture. Still a lot of the yellow showing through. With Juno's help and supervision, I applied a second coat of the watery mixture. Here's how the chair looked after the second coat of paint was dry. Still a little yellow showing through in spots. After letting the upholstery dry for another twenty four hours, I used a final, much thicker coat of one part medium, one part paint, and a splash of water, followed by some touch ups. Overall, I'm loving how it turned out; the fabric has a shiny, leather-ish look and feel. 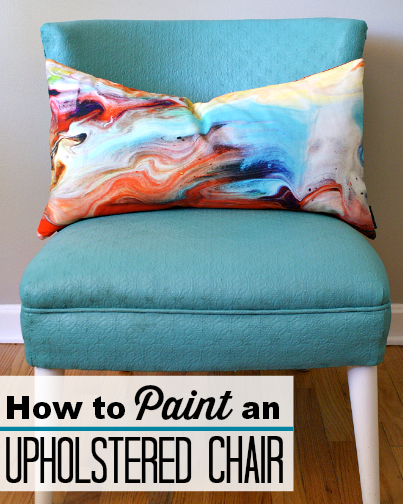 Painting upholstery isn't something I would do to furniture that is for everyday use, but it's an easy and inexpensive solution for little accent pieces. 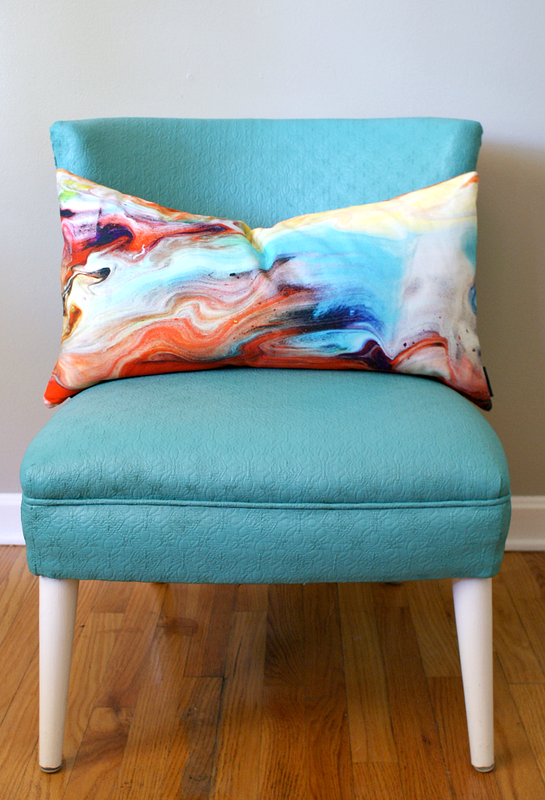 Painting this chair cost exactly eight dollars plus a twenty dollar toss pillow from Home Goods. I haven't finished up the office, I have a few more projects and a super fun piece I found at Junkstock that needs a little work. I'm hoping to have a post to share in a few days! Popping over from Winthrop Chronicles. Love the color you chose. The pillow really makes the chair pop. Great work, thanks for sharing! I tried this about 40 something years ago and it was a bit crunchy because I didn't have the medium to mix it with. Thanks for the "new" idea, I'll try it again.